With WUOC only a few days away now, the excitement is building! Nearly all of the athletes are now over in Europe, or on their way this weekend. The HPC (High Performance Committee) Communications Team are gearing up for 3 solid weeks of reporting, to bring you more than you ever thought you could know about the World Championship events this year! 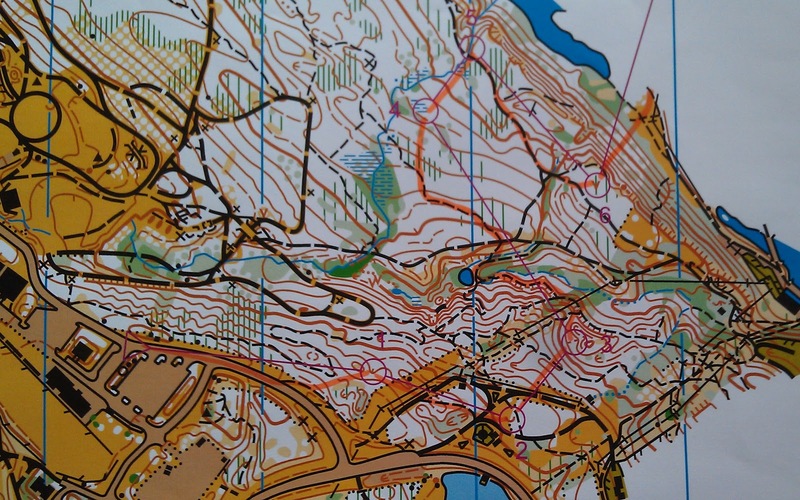 This blog post introduces the final championship on the schedule ~ the World Orienteering Championships, or WOC (pronounced 'walk'). WOC is being hosted by Lausanne, Switerland this year, and will run from July 14-21. This competition is open to athletes of any age, but countries can only send 6 men and 6 women, so you have to be able to qualify! This year, 44 countries from all inhabited continents are attending WOC. WOC includes a sprint, middle, and long event, as well as a relay. The sprint, middle, and long events all have a qualifier and a final. Each country can enter up to 3 runners in each qualifier. The only exception is that the current world champion is guaranteed a qualification spot in their discipline, so that country has 4 entries. There is an 'A', 'B', and 'C' qualification race, with a runner from each country in each qualifier. The top 15 runners from each qualifier go on to the final! There is only one relay, and all team mates must be of the same nationality! Along with our Team Canada athletes, here is a quick rundown of the runners to watch! Only 1 non-European has ever medalled at WOC (Hanny Allston of Australia), so not surprisingly it's all Europeans on the list! On the women's side, Simone Niggli has dominated the season so far and will likely add to her 17 WOC gold medals (and a handful of silver and bronze ones too) this year. The runners who have a chance to get in her way are Tatyana Riabkina of Russia, Minna Kauppi of Finland, and Helena Jansson of Sweden. As well as cheering for Louise Oram, also look out for Samantha Saeger and Alison Crocker of Team USA, who have both done well in the past. For the men, things are up in the air as favourites Danial Hubmann of Switzerland and Thierry Gueorgiou of France are both injured. Olav Lundanes of Norway has had a great season so far, so may have a chance, and the Swiss team have also been looking very strong this year. Jerker Lysell of Sweden, known as fast, fast sprinter, will likely be back to prove himself, after he skipped a control at last years WOC! Kiril Nikolov of Bulgaria achieved a silver medal in the long distance at the European Championships this year, so may throw a spanner in the works too! It's going to be fun to watch! The first WUOC race is on Tuesday, so tune in Monday for information on who's running for Canada, terrain information, who to watch, where to watch, and more! The countdown is on ~ WUOC starts in only 1 week, and some of the athletes are already winging their way to Europe to get over jet lag, and get a little European orienteering under their belt before the competition starts. Some team members will be blogging in Europe as time permits, so stay tuned! 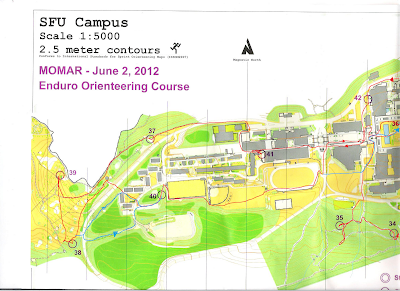 This blog post is to introduce the Junior World Orienteering Championships, or JWOC. JWOC has been running annually since 1990, and is open to national teams aged 20 or under as of December 31 in the year of competition. Each country can send up to 6 male and 6 female runners. There are 4 events ~ sprint, middle, long, and relay. The middle distance is the only race to have a qualification and a final. The other races are only held once, so you only have 1 chance to get it right! Unlike WOC, JWOC is more inclusive. Each athlete has the opportunity to run any and all of the races they choose! This can lead to very long starting blocks... For the middle distance, everyone runs the qualifier, then there are 3 ranked finals ~ an 'A', 'B', and 'C' final. Which final you are placed in depends on your time in the qualifications. 'A' final consists of the top 60 runners, the 'B' final has the next 60 runners, and the rest of the runners start in the 'C' final. The final courses are roughly the same length and will share controls. With the relay, if a country does not have enough athletes to make a team, mixed-country teams can be entered so everyone can run. This year JWOC will be held in Kosice, Slovakia from July 8-13. Canada is sending 7 athletes this year ~ 2 guys and 5 girls. Brent Langbakk is accompanying the team as coach, with parent helper Stefan Bergstrom assisting with preparation and onsite logistics. There is a huge amount of preparation that goes in to sending these athletes to an international competition, with accommodation, onsite logistics, all of those forms... a huge thank you to Brent and Stefan for their hard work so far! In addition to Brent and Stefan, Eric Kemp is accompanying as an assistant and media representative. Tune in to this blog, and we'll bring you updates before, during, and after the races; details on how you can tune in and watch live, and athlete interviews after the races. You can also follow us via Facebook or Twitter. WOC is 22 days away. I've been spending some time training with the WOC competition maps, just like in years' past and like I did leading up to the team trials this year. Lots of visualization training. A bit of draft course planning. I'm a bit wary of this type of training because I think you can get caught into the trap of just gazing at the maps, and I find it's key to make the practice into deliberate practice. The "10,000 hours of (deliberate) practice" anecdote often gets shortened to leave out the key part! In 2009, I remember making a very good prediction of the first long leg in the Long Quali. I also made a massive mistake as I was way too over-confident! Lesson learned. On the positive side, I think it can be very powerful to predict the type course you'll encounter, but I've learned my lesson about becoming too complacent when you encounter a 'familiar' leg during the race! For interest's sake, here are a couple draft courses I made for our Team Trials this year! Here in the US, it's a by now hallowed tradition for Mike Eglinski to comment in his blog each year on the age composition of the US WOC team compared to that of other nations. As far as I know, no one has a longstanding claim to that role in Canada so I'm going to step up and note what I think is a very positive development, the Canadian WOC team just named is surely the youngest one in more than a decade. The oldest members are Louise Oram and Will Critchley, both born in 1984. The average age is 25 years (compare with this year's US team average age of 30.2 years). On the male side, this came about through quite a competitive selection process in which a significantly older team certainly could have resulted if the younger runners hadn't raced well. On the female side, it's unfortunate that we're only sending one woman to WOC this year but there's every reason to believe the absent members of the very strong and young team of 2011 will both be back in future and there are eight other women 21 years old or younger in the senior and junior HPP who will no doubt be trying out for WOC teams soon. Summing up, hooray for our efforts of recent years when it comes to developing young athletes because good things have clearly been happening on that front. Locally here in Washington, DC, with the winding down of the spring season and all the associated travel and the end of the second Quantico Orienteering Club season with me as president, I can, to some extent, relax and focus for the next few months on putting in a good summer of training to prepare for the Canadian and North American Championships. As for Serghei Logvin, that means some non-orienteering racing, although I'll probably mostly or entirely avoid road races since I have a slowly healing bruised heel from the spring that hard running on pavement probably wouldn't much agree with. 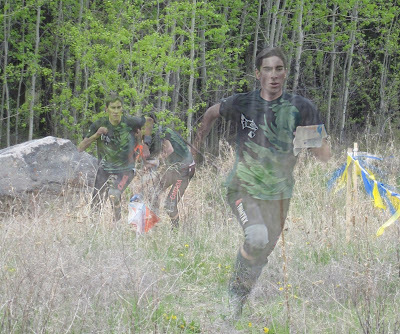 Fortunately, that was no obstacle to running, along with a fair number of other orienteers, in the most recent edition of the Bushwhacker Adventure Running Race this past weekend, which local race company EX2 Adventures held again this season after not having done so in 2011. 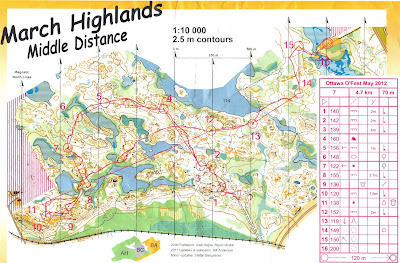 The race format is quite a lot simpler than for one of Golden Horseshoe Orienteering's adventure runs - it's basically a trail race with a small number of checkpoints en-route and off-trail shortcuts permitted between those checkpoints navigating using a slightly simplified orienteering map printed at 1:16,000. In contrast to past editions, this year it was an out and back race with somewhat less though still a significant advantage to be gained by taking well-executed shortcuts. 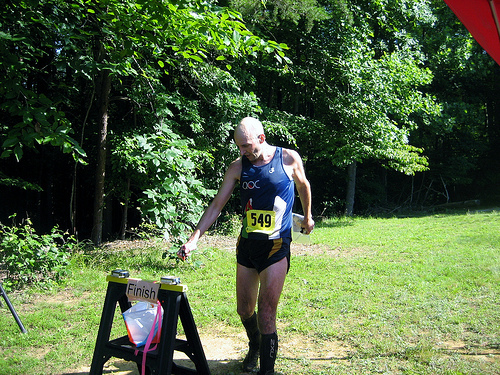 In the absence of any of the Mid-Atlantic regions other elite male orienteers, I nevertheless won handily, having shaken off any pursuers within a few hundred meters of the first time I left the trail perhaps a mile into the race, and all the other QOC members participating were in the medals in their respective individual or relay team classes, including the overall female winner, Amber Tomas, a new QOC member originally from Australia. I can only hope non-orienteers don't find that too discouraging. The race hasn't, historically, done very well attendance-wise for EX2 - never more than 100 participants in previous editions when the same company routinely sells out both spring and fall series of trail races that they cap at 300 participants - so for financial reasons it's by no means certain it will be back next season. This year's ~150 participants was therefore a definite improvement, which I expect can be ascribed largely to this being the first year that two-person relay teams were allowed. Perhaps the race would be more successful if, as with GHO's adventure runs, it changed venues each time it was held and offered more challenging navigation. Or that might lose even more of EX2's usual trail running clientele. 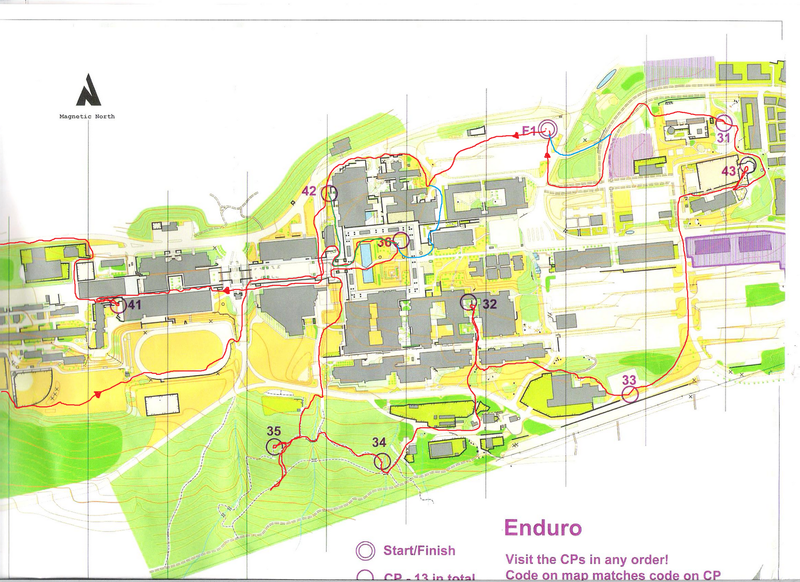 Maybe it would do even better if it copied the GHO formula even more closely and in addition to more challenging navigation was exclusively for teams that had to do the whole course together. All I'm certain of is that clearly even a racing company with an excellent local reputation clearly doesn't find it easy to get people to dip their toes into races involving navigation. I'm therefore all the more impressed by GHO's achievement of bulding up their adventure running race series to the point they have. Photos courtesy of Heidi and David Onkst. The Countdown To Europe ~ Intro to WUOC! As you are hopefully aware, our Canadian athletes are now gearing up to go to Europe for the world championships! 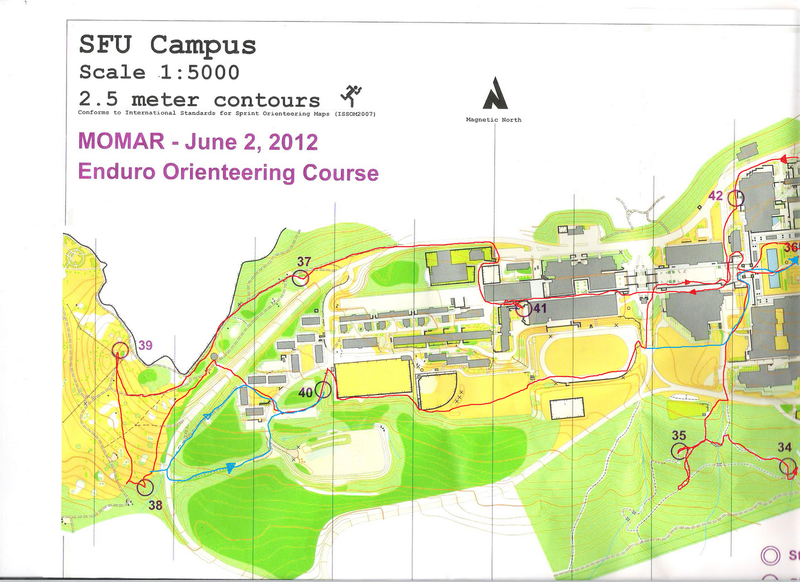 This year the 3 big championships are back to back ~ the World University Championships (WUOC) run from July 2-7, the Junior World Orienteering Championships (JWOC) run from July 7-13, and the World Orienteering Championships run from July 14-21. Canada is sending a strong team of athletes to each of these events. To ensure that you're as excited as we are about these championships, and to keep you informed of all the inside gossip, the High Performance Committee's (HPC's) communications team will be bringing you more information than you ever wanted to know! Tune in to this blog where you'll find pre-race coverage, terrain analysis, goals and thoughts of the runners, along with all the links you'll need to watch the race live online! There will also be post-race coverage with analysis, athletes thoughts, maps, results and splits, photos, and so much more! So make sure you stay tuned and read up on all the events. And, of course, your comments are always welcome, as we support and cheer on our Canadian athletes! Today's post is an introduction to the WUOC! This is the 18th time WUOC has been held, and unlike WOC and JWOC, WUOC is only held every 2 years. Athletes must be between 17 and 28 years old, and must be either working towards a degree or diploma, or have graduated in 2011. This year, athletes will travel to Alicante, Spain for 4 days of exciting races! View Larger Map - Alicante is on the south east corner of Spain! Each country may send a team of 12 competitors (6 men and 6 women). For the sprint, middle, and long distance races, 4 runners from each country are able to participate. For the relay, countries can enter 2 teams of 3 runners, although the team with the best result is the one that will count in the official results. The relay (July 6) teams will be decided at the event, although we have insider information that Louise Oram has been approved to run on a men's team, which means all the guys will get to run! Maybe some healthy competition between the Canadian teams?! From July 2nd, when you log in to the Team Canada blog you'll find pre-race coverage, terrain analysis, goals and thoughts of the runners, along with all the links you'll need to watch the race live online! There will also be post-race coverage with analysis, athletes thoughts, maps, results and splits, photos, and so much more! Let's hear your cheers; Go Canada Go! Those who came to the Canadians last year will remember the two stellar maps produced for the events. This year, we got the opportunity to revisit the maps from a different angle. It was a week of great orienteering! Friday after school found most of the YOT members waiting for our coach at the Mt. Lorne Rec. Centre. We did a short practice, mimicking the relay at JWOC. We each got a map with 5 short courses on it. There was a lot of forking and controls close together to make you think twice. It was a lot of fun, and it got a lot easier towards the end in terms of ignoring what everyone else was doing. The training map...was easy to get lost on! Once we got back to our accommodation (yurts!) we went swimming and Brent lead us through some mental exercises in preparation for those going to JWOC. We rejoined civilization the next day at the sprint, held at the other end of the Lewes Lake map. The landscape was similar to a moonscape. My assigned start was at the start of my category, with the other runners starting at 1 min intervals after me. I had a great race, except for one particular control. There was a loop off the go control, and while I subconsciously realized there was a loop off the go control, I didn't actually realize it. This resulted in my frantic panic as I didn't pay attention to my map, and ran in circles. The middle started after a well needed rest. I managed to convince myself that if I went a little slower and stayed in control, then I would be all right. This strategy worked for the most part. I had a good couple first controls, was able to keep on track and planed out my routes. I had a couple of sticky controls, mostly not following through with my plans, and ending up a little off. However, I was fairly happy with it overall. I just wanted to let you know that I re-ran the 13 control course at Simon Fraser University. Having already run the course and having pre-planed a superior route allowed me to cut my 41 minute time down to a 31:33. Route choice is important people! As my plans of getting a taste of European Orienteering did not take place this year, and the Orienteering season slowly wound down for me, I decided to enter a few trail and road races, which are always a blast to participate in, as well as give an objective measurement of my physical shape. I had always liked the 5 Peaks race series, as I find it might be the closest you can come to fast competition in nature after Orienteering and short Adventure races. In the years prior, I had run two 5 Peaks races, both of which I greatly enjoyed, and had won one of, and was 2nd on the other. Awesome technical trails, great race atmosphere and decently competitive field made me look forward to my next race. The race I registered for was to take place at Hardwood Ski and Bike, near Barrie, ON. It was a bit of a drive, about 300km round trip, but not too bad. My training was going quite well leading up to this race, and I was feeling pretty good, which made me look forward to it even more. With about two days to go, the weather forecast was set for a thunderstorm, which would make things extra exciting. Luckily, on race day, the rain had stopped early in the morning, and by start-time we were left with only intense humidity and pretty slick trails. I did a relatively short warm-up, and had really noticed the humidity right away, with my HR jumping around very easily. We were finally called up for the start, I made my way to the front of the pack, and we took off. 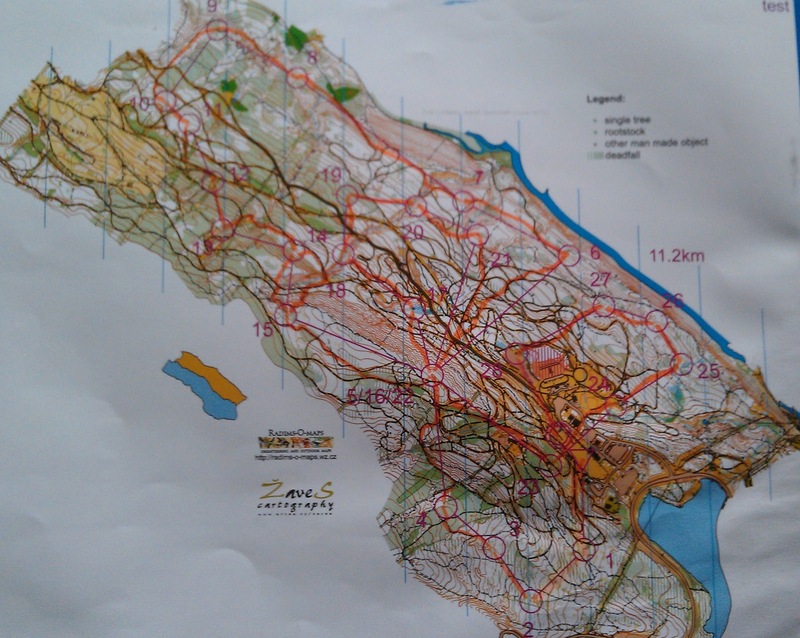 The interesting thing with 5 Peaks events is that the Sport (~6km) and Enduro (~12km) courses start at the same time. Since I always run the Enduro course, it usually indicates a quicker pace than I should set off the start. Even so, I was usually able to settle into a good pace later on; this wasn't one of those times. As we're starting off, I'm very comfortably running at the front of the pack, with the leaders of the Sport course, with all of the Enduro runners behind. One of my greatest weaknesses going into this race with regards to my preparation, was that I had no idea what type of course to expect, except for this. Unfortunately no elevation profile was given, and no distance markers were set along the way. As humidity started doing its job, the hills just kept on coming and coming, and I could feel this reflected in my legs and HR. At this point, I'm starting to suspect that I've started off way too fast, as I'm working way too hard. I knew the winning time from last year was slightly under 57 minutes, and I think to myself "I must be running for at least 20-25 now", but my watch didn't think so, as it was showing just over 10 minutes. This was when I realized I'm in for a rough ride, while the hills kept coming. It seemed like the only times to recover for the next hill was either during twisty technical parts, or while hammering down the hills. I felt my legs starting to get pretty drained, and I noticed my loss of grip on the uphills a lot more now. My choice of shoes was an extremely worn-down pair of X-Talon 212s, great shoes, but probably not a great choice for the slick trails. I was slowly dropping the pace as I was trying to figure out my best tactics to make the best of what I had. I decided I needed to drop below the redline, and try to run a more even race towards the end. I didn't expect that to go too well though, because I was in a pretty tough position. It is incredible how lack of racing and adrenaline can really mess up your feel for proper race tactics, as this was the first official "running" race I've done after my break in 2010/2011. After all the years of XC, trail and road racing, I had a very good feel for pacing great negative splits. I felt like a total newbie, but had to work with what I had. The Sport runners had broken off on a different course just as as the winner of Enduro passed me. I saw him on the twists for the next little while, and even seemed to gain some ground on the downhills. I was trying to take it easy though, and soon had heard the 2nd place behind me. We ran a good 2-3km together, and he had passed me when I almost wiped out on a slippery turn, and then broke away on the next uphill. I was slowly coming back into my comfortable pace, but sometimes the hills would come as a series, one after another, which would send me redlining again. As I was into the second half of the race, I got a glimpse of the 2nd place, as it seemed I reeled him back in a bit. However, to my semi-surprise, I thought I got a glimpse of someone behind me. I had hoped that wasn't the case, but my fears confirmed as I got a clear picture of two runners on my tail. Of course this made me feel even worse about my tactics, but I didn't intend to give up. I pushed the pace slightly, and that seemed to hold them off for a bit. The hills kept doing their thing, and I was red-lining big time. The time was approaching 45 minutes, and I was estimating to run just over 1 hour, as I knew last year's winning time. I kept hearing the hammering of two pairs of legs behind me down all the hills for the past 15 or so minutes, and it kept me very uneasy. Every racer knows, that once you're in front, and are being chased down, you are very vulnerable, and lack the element of surprise. There was a section of the trail that passed through very open woods, and bent around, where I saw that the two runners were maybe 10 seconds behind me at most. They were gaining on me majorly. Thoughts of 5th place started to creep in and find comfort in my mind. Then, for some reason they fell back slightly, and in the next km, I realized one of the guys got dropped, and the other one was on a chase for me once again, this time by himself. It looked like he was kicking for the finish, as he was slightly gaining on every stretch, no matter how much I pushed the tempo. Eventually I had to do the same, to keep him at a distance, but was doubtful of it, because the time was only slightly over 50 minutes. Shortly after, as I'm coming out of the woods onto a the ski hill, and hear the finish crowd, I think we must do another short loop before we're done. However, I'm told there's another 400m to go, and this is where I give it my all. I put a pretty big gap between us in that distance, and was happy, but surprised to be done. Turns out my time of 56:11 would have been enough for a win last year, with many of the same runners, including the 2nd place finisher. From speaking with the finishers, most of them had run the course before, and some are regular bikers of these trails. It will help for next year to have been here before, if I come back. I had the pleasure of running under "Team AttackPoint". It consisted of me (runit), Nikolay, Galyna, WandAR, FunRun, Bash, 'Bent, DoubleDown_on11, FB, Will, Hansel, Leanimal, Pat-hectic, Wilsmith (missing in photo). I thought that was pretty cool - represent! It was a very close competition, and we took 2nd place by a couple points because the other team had lots of points for volunteering. As always, this event had an awesome atmosphere and vibe, but it was even better to be in a company of so many familiar faces! I had a great time. Of course I need to learn on the mistakes I made at this race, and improve upon them. I feel like post-race analysis for these types of races are (almost) as important as after Orienteering races. I might have hung onto 3rd place this time, but I need to act differently to avoid these types of situations again. I feel like I could have shown a much stronger performance, and met my own expectations for this race, if I was smarter. I am also looking forward to running the Canadian Championships in August, provided I am able to plan things out better this time, and actually make it. Should be a great experience. I wish good luck to everyone racing in Europe these coming weeks - run strong and proud! Just a couple weekends ago was the Ottawa O-Fest, which is one of the biggest annual meets in Ottawa. It was a great weekend full of lots of orienteering and gorgeous but hot weather. 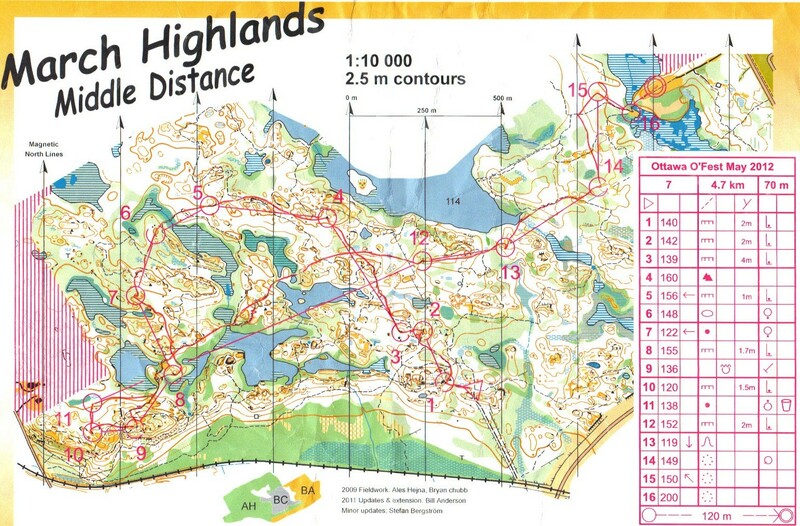 There was the typical sprint, long, middle, and relay but my favourite and best race was the middle at March Highlands. I was a late starter and it was getting pretty toasty in the sun, but under the shade of the trees it was still manageable. My goals for the race were to take the straightest routes that looked good and to use my control description to ensure I knew what the control was on and what side of the feature. I started out feeling great but it took me a couple of controls to really get into the map. I had a couple seconds of hesitation on control 2 because I started looking for the control a bit too early. It was nothing serious though and I was able to continue with renewed confidence. Unfortunately, on my way to 4 I was running over a boulder patch and tweaked my ankle. It didn’t affect my race until after I got back but it was a good reminder that strong ankles are always important in this sport. Brushing your teeth while standing on a pillow anyone? As I was running to 11 I saw the intimidating leg to 12 and had to pause for a couple seconds to see which route looked best. I decided to avoid the majority of the trails since they were mainly for mountain bikers and therefore went over all the hills and through the open bare rock areas. I decided to take the straightest route that wound in between the swamps. I was quite happy with my route since I had many prominent features that I was able to check off along the way. I just had to be careful to not mix up the swamps! Reading the control description carefully before you get to the control makes it much easier to have a clear image in your head of the control circle. If you know which side of the boulder the flag is on, or if it’s at the foot of the cliff, then you can save a few seconds at each control. It also saves you the panicked feeling that you get when you arrive to where you think the control should be but you can’t see it because it’s on the other side of the hill. For example, when I was running to control 10, I knew that it was placed at the foot of the cliff so I made sure to stay low on the hill to be sure to see that glimmer of orange and white. Overall the race was fantastic! We got to race some really technical courses in some beautifully runnable woods and I think that everyone thoroughly enjoyed it. The weekend was a great success and a big thank you to all the organizers that put so much of their time into it! I'm a first year member of the HPP. Like Will Critchley, I have transferred my focus from Cross Country Skiing to Orienteering. 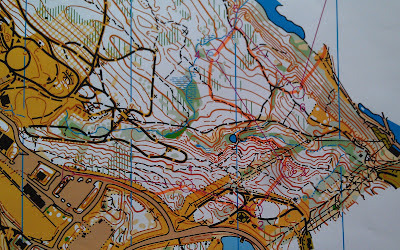 Last weekend I had a chance to try a type of orienteering I have little experience with. It was a 13 control course that one could complete in any order. It seemed similar to a score O but there was no time limit. I ran it in about 41 min with multiple mistakes to be learned from. It went wrong from the beginning. I ran off towards 42, thinking I was heading towards 31 due to a disoriented map. Then I failed to see a route to 36 (the route in blue) and headed to 42 instead. To add insult to injury I mistakenly decided not to double back and hit 36; this mistake forced me to run further on my route back. Lessons Learned: a) Plan routes ahead of time- when doing so look for a straight route, one to the left and one to the right. For more on route choice take a look at the route choice activity from the recent HPP camp, and the analysis. c) The ever present "orient your map"
Heading from 38 to 40 I failed to keep my head up and see the white forest that allowed me to take one of the paths to 40. There where various options for routes to 36; figure out what you would have done. My route was the results of changing my target from 35 to 36 part way though the route. Control 35 reminded me of the importance of looking up (especially when nearing the control circle) as I ran past the trail to 35 without seeing it. Lessons Learned: a) Look up! b) More route choice practice would be especially beneficial for me. Finally, I wanted to thank you all for supporting the HPP and providing me with a chance to improve my orienteering. I am improving rapidly but still have lots to learn. 2012 Team to World Championships Announced! COF would also like to acknowledge and thank the selection committee for their hard work. Selection is never an easy process, and this year Magnus Johansson, Brian May, and Magali Robert stepped up to the challenge. Selection is not only based on the results of identified priority races, but also training consistency, recent performance at WOC and other events, and opportunity for younger athletes with potential for success. You can find all the details in the 2012 Athlete Handbook. COF will be bringing you the inside scoop on the Junior World Orienteering Championships (JWOC), the World University Orienteering Championships (WUOC), and WOC, so make sure you log on and tune in on the Team Canada Blog, on Facebook, or on Twitter. 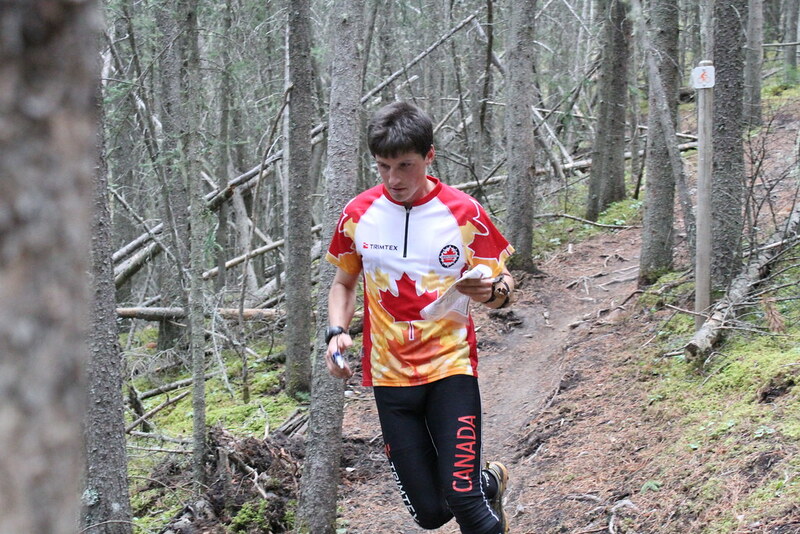 The past two weekends saw the two "especially important" priority selection races for the senior Canadian orienteering team; one in eastern and one in western Canada. The selection for the senior WOC team is an involved process. Team Canada wannabes must attend at least two of five priority races, and at least one of the two "especially important" priority races, listed below (the "especially important" races are bolded). The selection committee then makes their decision based on results of these races, as well as other factors such as training quality and consistency and other significant event results. You can find more info about the selection process in the athlete handbook. The selection committee, comprising of Magnus Johansson, Brian May, and Magali Robert, are now in top secret talks to decide which 6 men will represent Canada at the World Orienteering Championships, scheduled July 14-21, 2012 in Lausanne, Switzerland. Due to scheduling conflicts and illness, Louise Oram is the only woman set to represent Canada. She is currently sidelined with a bad ankle sprain, so send her your healing thoughts. We hope that she'll be fit to run in Lausanne! 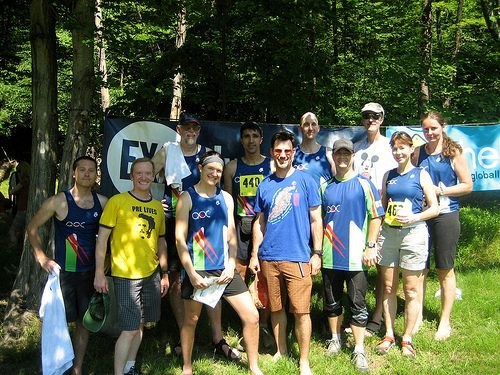 The eastern selection races were held in Ottawa, as part of Ottawa O-Fest. By all accounts it was an amazing weekend of racing under 30 degree skies! The first race of the weekend was a fun middle course held at the March Highlands. Eric Kemp of Ottawa had a fantastic race, with Sergei Zhyk in second place. Andrew Childs of GMOC had a great run coming in third, with Team Canada hopeful Serghei Logvin in fourth place. Patrick Goeres had a great race, but missed control #5 by reading ahead. There was an incident involving one control (control #7 on the men's course) where Wil Smith and James Connell both came back not too far apart from each other claiming the battery on that control was dead. The organizers had decided not to attach manual punches to the SI stands (note to all meet directors, when you cut corners, the unexpected always happens!). The meet directors took their word and re-instated both runners, but discovered later that other people punched the control between the two runners and after them too. Was the battery on the blink switching on and off? It's a mystery! You can find the full results list and for the men's elite race here! Saturday afternoon saw the sprint race at Tunney's Pastures; a fast paced urban sprint. Patrick Goeres kept up his reputation of sprint guru, beating second place Serghei Logvin by a minute! Eric Kemp did a great job to hang on to third place, but had a 30 second error running past a control then having to run back because he wasn't sure he'd punched it! When you're running right on the edge of technical and physical ability, it's tough to also find the mental energy to remember those little details (but that's why we love orienteering, right?!) Check out the full results and split times. Eric Kemp on the long course. Photo kudos to Bill Anderson! The long distance race was held on Sunday. Due to the high temperatures, a number of runners did not complete the course. Eric Kemp held it together and crushed the competition with a time of 1:39:39, nearly 10 minutes over second place Wil Smith! Team Canada hopefuls Nick Duca and Jon Torrance finished 4th and 5th respectively. Patrick Goeres was having a great race, until control #15 where a branch in the eye took out his contact lens! Unable to see, he had to bow out gracefully, even though he was leading by over 4 minutes (note - bring spare contact lenses on course!). One of the top US runners, Sergei Zhyk, pulled out after control #7, claiming he'd "run out of gas". He was leading until that point, so maybe went out too quickly? In 30 degree heat you've got to pace yourself! You can view the first and second maps, and see the full results. From May 22-25, junior HPP coach Brent Langbakk held an HPP training camp in Canmore. It was well attended by 9 enthusiastic HPP members. We recommend you check out Brent's blog, as he's going to be posting details of some exercises he offered. You can also read Kerstin Burnett's account of the training camp (sounds like it was a tiring week!) Thanks to Brent and Larry Konotopetz for their hard work to put this camp together! 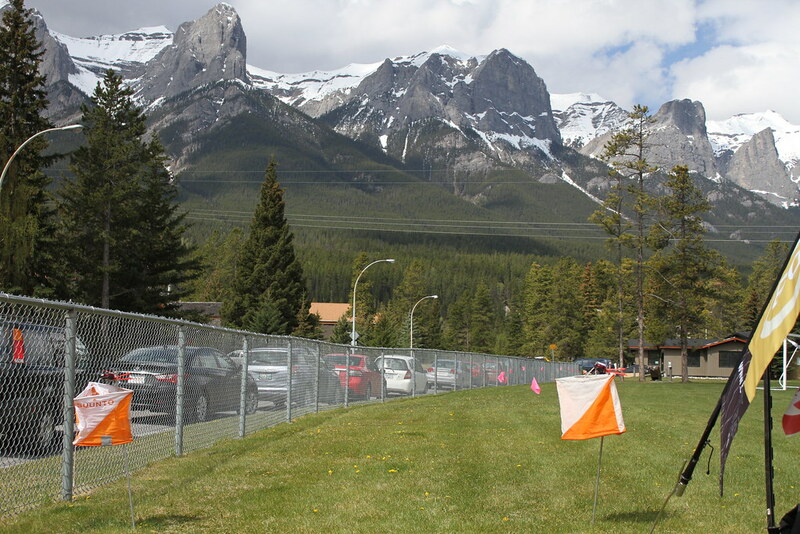 Last weekend, May 26-27, saw Canmore and Barebones hosting the western selection races. It wasn't quite as warm there; around freezing overnight, getting up to the mid teens during the day. Those who camped definitely had a chilly night! I love this quote from Eric Kemp "Feels good to be alive when you're bombing down a mountain and spiking your controls". Pretty much sums the race up! Does it get much better than this? Answer; no! Finish chute for the Sprint. Photo kudo to Graeme Rennie! Will Critchley pushed his hamstring injury aside to take the win, just ahead of Patrick Goeres. Jeff Teutsch had a strong race to come in third, with Mike Smith and Damian Konotopetz in fourth and fifth. Due to on-coming illness, Eric Kemp decided to save himself for the middle event the next day! 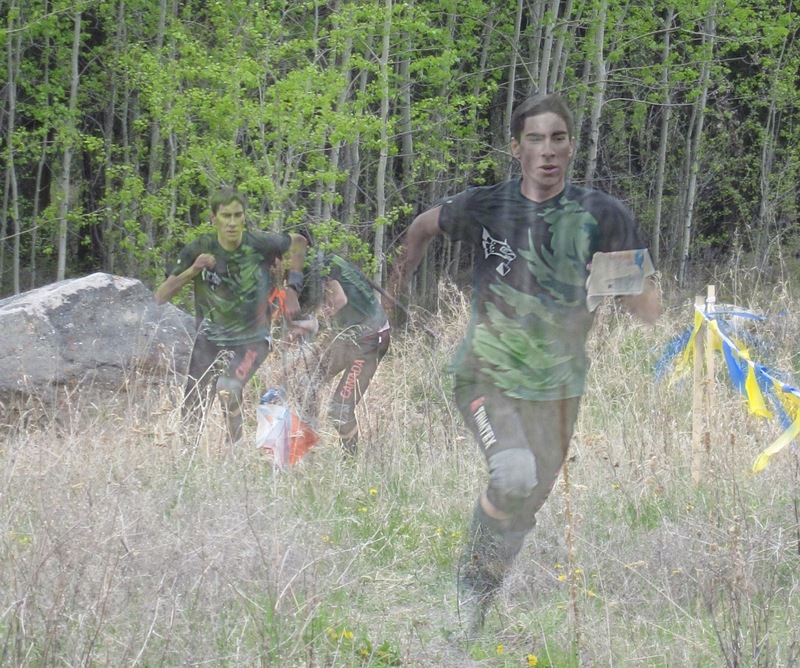 The middle distance race at Mount Laurier was held on Sunday morning. This tricky area of incredible contour detail and fabulous open running makes for a true test of fine navigation at high speed. Will Critchley proved again that he's a force to be reckoned with, winning the elite category. Sitting out the long was obviously a good choice for Eric, who came in second. Patrick Goeres showed he's still got it, coming in third. Mike Smith had a strong race in fourth place. Around control #16 on the elite course, some runners came across two bear cubs! The word quickly spread, and suddenly runners were having to orienteer and shout out to scare the bears away! Running + navigating + shouting = tiring! An orienteer also came across the mother bear standing on her hind legs, sniffing the air ~ we were all pretty sweaty, so I'm sure she smelt us all from miles away (although we were also right beside the landfill, so maybe we weren't that smelly!) To top off a fun weekend, the junior from Calgary had set up a micro-O as a fundraiser. I know I certainly was confused for the first control, having to convert from a 1:10000 map to a 1:2500! Great job kids, it was a blast! A huge thank you to Adrian Zissos and the Barebone's team for a fantastic weekend of races! Barebones managed to get some local press coverage in the The Rocky Mountain Outlook and the Canmore Leader. The caption on the front page photo is particularly cute! Ottawa O-Fest also managed to get on CBC news! Check out the clip below ~ nice work guys! Stay tuned for the team selection announcement ~ we have it on good authority that an announcement is coming in the next few days! You'll hear it here first!